Michael and Rebecca Cooper featured styles from the late 1700s and early 1800s. For more photos, visit wnewsj.com. 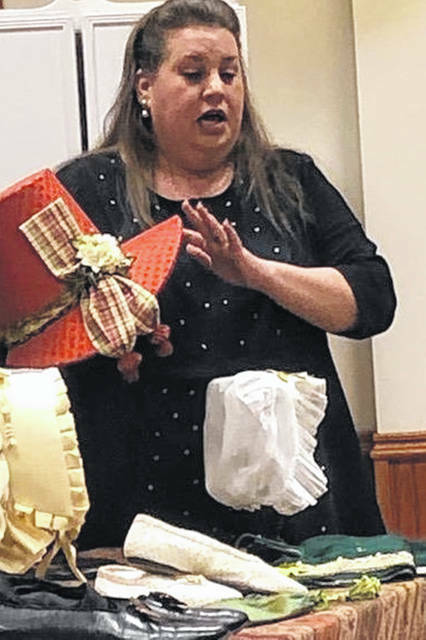 WILMINGTON — The Clinton County Genealogical Society met on Jan. 28. President Susan Henry called the meeting to order. meeting were approved as read. The treasurer’s report and proposed budget were approved. A few volunteers to work in the library are still needed. Library training is at 10 a.m. Feb. 14. Saturday hours may be extended. The next meeting will be at 7 p.m. Feb. 25 at the Cape May library. Christine Snyder and Susan Henry will present information about their Nantucket ancestors, the Starbucks and the Coffins. 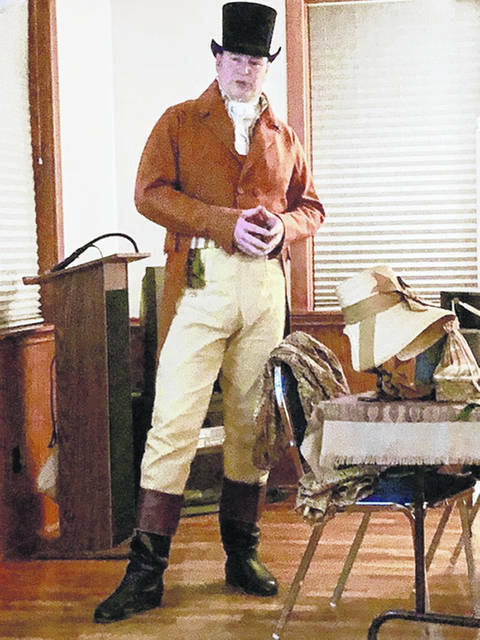 In the program, Michael and Rebecca Cooper used slides of paintings by John Lewis Krimmel to present “Fashion in the New Republic,” featuring clothing from 1790-1840. Michael dressed in clothing representative of the period including a coat with tails, a vest, a ruffled shirt, fitted trousers and boots. He wore a round hat, which was very stiff and round when new. Over time, it conformed to the shape of the wearer’s head. Michael and Rebecca said that, contrary to common belief, most people did not dress like Davy Crockett or wear only homespun or linsey-woolsey, but were actually quite fashion conscious. Almost everyone had at least one good set of clothing, and most people had more. As people worked to better themselves, they chose clothing that projected success. Slides of the Krimmel paintings showed the trends in fashion of the period. Fashion plates brought sketches of the latest styles from Europe and were immediately incorporated into American styles. Colorful clothing was very popular. Shoes for both men and women were often slippers. Military uniforms of the period varied from company to company by style and by color. In many cases, different colors for different positions, e. g. riflemen or infantry. 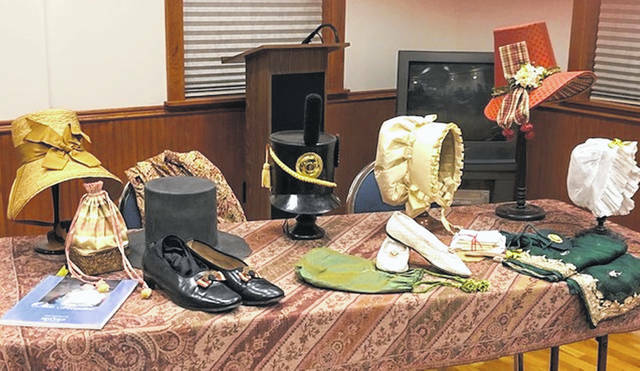 Rebecca was not in costume due to an injury, but presented items that she has made that are true to the period, including hats, bonnets and slippers. 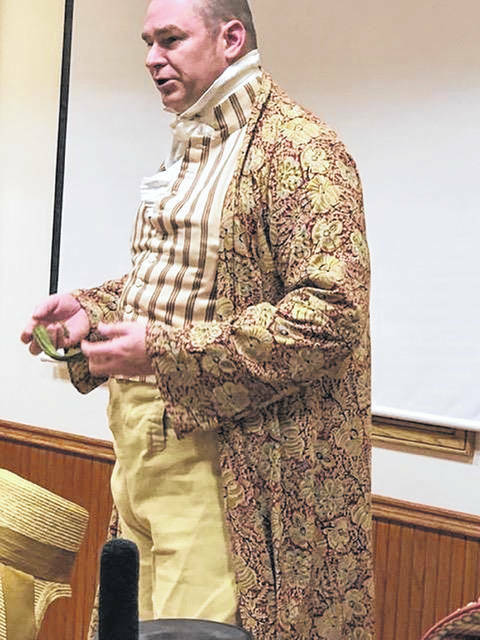 https://www.wnewsj.com/wp-content/uploads/sites/22/2019/02/web1_IMG_1770.jpegMichael and Rebecca Cooper featured styles from the late 1700s and early 1800s. For more photos, visit wnewsj.com. https://www.wnewsj.com/wp-content/uploads/sites/22/2019/02/web1_IMG_1774-2.jpegMichael and Rebecca Cooper featured styles from the late 1700s and early 1800s. For more photos, visit wnewsj.com. https://www.wnewsj.com/wp-content/uploads/sites/22/2019/02/web1_IMG_1775.jpegMichael and Rebecca Cooper featured styles from the late 1700s and early 1800s. For more photos, visit wnewsj.com. https://www.wnewsj.com/wp-content/uploads/sites/22/2019/02/web1_IMG_1786.jpegMichael and Rebecca Cooper featured styles from the late 1700s and early 1800s. For more photos, visit wnewsj.com.